For Audio, Video, Gaming, Recording, Computers and Other Equipment. "All who know me well know how I'm stingy in awarding degrees Editor's Award for a product." "...Cones without a doubt take the Vibrapods to the next perfomance level." "In my experience, that makes them the best buy in audio--nothing else begins to come close." "What was really telling in my going back and forth from cones to Pods was that, when the Pods were on duty, I would forget what I was doing and just sit there listening. Doesn't that say it all?" "Forget all that stupid voodoo-science others may have told you and test drive a set of Vibrapod Isolators: your ears will definitely thank you. "Synergizers, this is simply the single most significant tweak I've run across - hands down. "Short of a complete megabuck overhaul, I have never heard (or heard of), anything that got that kind of overwhelming, dramatic improvement!" 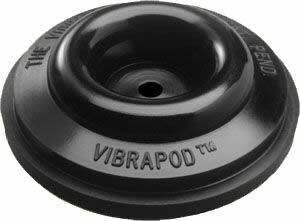 "It's hard to beat the cost/performance benefit provided by the Vibrapod isolation feet, seen nearly everywhere this year."